Apple Attacks The Droid X, Too Desperate? Motorola’s Android based smartphone Droid X was declared the biggest iPhone 4 competitor as soon as the phone’s features were revealed to the media. A lot of critics and experts were quick to produce their lists of reasons to buy a Droid X instead of the new iPhone. It looks like Apple was watching and listening carefully to all of it and after demonstrating the signal loss problems with some of the popular smartphones at the ‘antennagate’ press conference, it’s now hitting at the one that probably matters the most. At least that’s what it looks like by watching the latest video that Apple posted on its own site and YouTube. 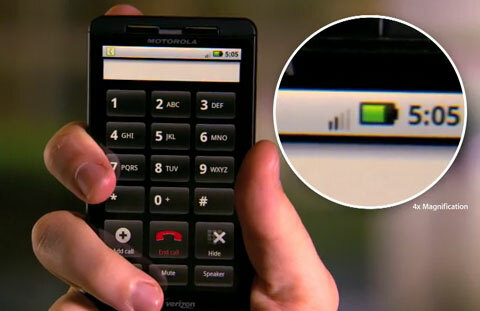 The latest video shows how the Droid X also loses signals when held from the antenna spot, especially in low reception areas. That may be correct but the question being asked is that why wasn’t there as big a ruckus about the antenna problems of the Droid X or any other phone as there was about the iPhone 4. Apple posted a similar video about the Nokia N97 Mini a week ago and now with this one it’s starting to look a little too defensive and desperate which it doesn’t need to be. iPhone 4’s sales reports are the biggest proof of its popularity and if such a big media scandal didn’t slow them down, nothing else can. So calm down guys! You can check out the video posted by Apple below. interesting. why is it that in all the Apple ads the iPhone is held in the left hand, with the palm shorting out the iPhone4 antenna, while in this ad they depict the Droid being held in the other hand. I wonder if they would get the same results if it is held as most people would… in their left hands. Definitely trying too hard. If your product has a defect the right thing to do is admit it and fix it. Pointing out a competitors defects just shows Apple has no class.